Iredell County is an administrative division (county) of the U.S. state of North Carolina. According to US Census projections in 2017, the population was 169,798. Its county seat is Statesville, and its largest town is Mooresville. The county was formed in 1788, annexed from Rowan County. It is named for James Iredell, one of the first justices of the Supreme Court of the United States. Iredell County is included in the Charlotte–Concord–Gastonia, NC–SC Metropolitan Statistical Area, as defined in 2013 by the Office of Management and Budget with data from the U.S. Census Bureau. Prior to colonization, three Siouan-speaking tribes associated with a culture group called the Eastern Siouans probably inhabited the area that is now Iredell County. Broken into several smaller tribes, they were the Catawba, the Waccamaw Siouan, the Cheraw, the Winyaw, the Wateree and the Sugaree. The following list shows significant events and firsts in the history of the area that is now called Iredell County, North Carolina. 1754–1763, Fort Dobbs (named after Governor Arthur Dobbs) was erected as a defense facility during the French and Indian War (1754-63). Today, the location of Fort Dobbs is a North Carolina State Historic Site. 1788, Nov 3, Iredell County was incorporated in 1788 when it was formed from adjacent Rowan County. It is named for Honorable James Iredell, Sr. (1751–1799), Attorney General of North Carolina during the Revolutionary War, Supreme Court Justice, and a delegate to the Constitutional Convention of 1788. Its county seat is Statesville. 1800, US Census shows 11 heads of household, including 68 free white persons and 27 slaves in "States Ville"
1847, The only major cession of Iredell territory to another county was that to Alexander County, created in early 1847 from Iredell, Burke, and Wilkes counties. 1891, Aug 27, The railway accident on the Bostian Bridge killed 23 people on August 27, 1891, west of Statesville, North Carolina, when a Richmond & Danville Railroad train derailed. 1900s, Industries producing tobacco, liquor, and herbs (Statesville's Wallace Herbarium was one of the largest such facilities in the world during the late 19th and early 20th centuries) were later supplemented by the production of livestock, dairy products, and breeder chickens, of which the county remains a leading producer. According to the U.S. Census Bureau, the county has a total area of 597 square miles (1,550 km2), of which 574 square miles (1,490 km2) is land and 23 square miles (60 km2) (3.9%) is water. Iredell County is located within the Piedmont Region of central North Carolina. The northwestern section of the county contains the Brushy Mountains, a deeply eroded spur of the Blue Ridge Mountains far to the west. The highest point in Iredell County, Fox Mountain, is in the Brushies; it rises to 1,760 feet. Although the "Brushies", as they are often called locally, are not high in the normal sense, they do rise prominently above the surrounding countryside. The remainder of Iredell County consists of gently rolling countryside occasionally broken by low hills and small river valleys. The county's largest river, the Catawba, forms much of its western border. Lake Norman, North Carolina's largest manmade lake, is the most prominent geographic feature of southern Iredell County; it is often called North Carolina's "inland sea". Iredell County is an important transportation center for the state, as Interstate 77 and Interstate 40 cross in northeast Statesville. This has given birth to the county's slogan "Crossroads for the Future." Residents have easy access going south on I-77 to Charlotte; north on I-77 to Elkin, North Carolina and Roanoke, Virginia; east on I-40 to Winston-Salem, Greensboro and Raleigh; and west along I-40 to Hickory, North Carolina and Asheville. The northern third of Iredell county is highly rural and contains no large towns. Due to the thinly populated nature of this portion of the state, it is one of the select places in North Carolina where the speed limit on Interstate Highways exceeds 65 mph, as Interstate 77 north of Statesville has a speed limit of 70 mph. Iredell County is one of the longest counties in the state and stretches for nearly fifty miles north to south from Yadkin County in the north to Mecklenburg in the south. In the 1700s and 1800s, before there were many towns in what became Iredell County, property was identified by stream, rivers, or adjacent landowners. The following is a list of the streams, rivers, and creeks in Iredell County. As of the census of 2010, there were 159,437 people, and 59,593 households in the county. The population density was 277.8 people per square mile (82/km²). As of 2013[update] there were 69,325 housing units at an average density of 90 per square mile (35/km²). The racial makeup of the county was 83.3% White, 12.3% Black or African American, 0.5% Native American, 2.2% Asian, 0.1% Pacific Islander, 1.68% from other races, and 1.6% from two or more races. 7.0% of the population were Hispanic or Latino of any race. According to the 2000 census data, there were 47,360 households out of which 33.5% had children under the age of 18 living with them, 57.8% were married couples living together, 11.3% had a female householder with no husband present, and 26.8% were non-families. 22.7% of all households were made up of individuals and 8.4% had someone living alone who was 65 years of age or older. The average household size was 2.56 and the average family size was 3.00. In the county, the population was spread out with 25.5% under the age of 18, 7.5% from 18 to 24, 31.3% from 25 to 44, 23.3% from 45 to 64, and 12.4% who were 65 years of age or older. The median age was 36 years. For every 100 females there were 96.1 males. For every 100 females age 18 and over, there were 93.1 males. As of 2013[update], the median income for a household in the county was $50,058. Males had a median income of $34,590 versus $24,031 for females. The per capita income for the county was $26,348. About 6.2% of families and 13.5% of the population were below the poverty line, including 10.1% of those under age 18 and 9.8% of those age 65 or over. Iredell County is governed by the Board of Commissioners, consisting of five commissioners elected at-large. This requires each to attract a majority of the votes, precluding election of candidates who represent minority viewpoints. Iredell County Commissioners (2016–present): James Mallory (Chairman), Marvin Norman, Tommy Bowles, Jeff McNeely and Gene Houpe, all Republicans. The Sheriff of Iredell County is Darren E. Campbell (Republican), elected in December 2014. He succeeded Phillip Redmond, who was first elected in 1994. The Register of Deeds of Iredell County is Ronald "Duck" Wyatt (Republican), appointed in 2016. The Register of Deeds serves as custodian and manager of a large number of land records and vital records. Iredell County is part of prosecutorial District 22A with Alexander County. 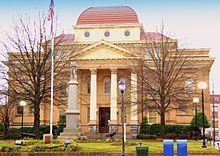 The Iredell County Courthouse is located in the county seat of Statesville, North Carolina. The District Attorney is Sarah Kirkman. The Senior Resident Superior Court Judge is Joe Crosswhite. The Chief District Court Judge is Dale Graham. James Lee (Jim) Mixson III has served as Iredell County’s Clerk of Superior Court since 2012. Clerks of Superior Court in North Carolina also serve as Probate Judges in addition to their administrative duties. Since 1952, Iredell county voting records show a strong Republican majority. Before 1952, however, Iredell was part of the Democratic "Solid South" and voted for no Republican presidential candidate after Reconstruction except Herbert Hoover in 1928. In 1964, the year that national civil rights legislation was passed, it was one of 13 North Carolina counties to vote for Barry Goldwater. In the past 17 elections, the only Democrat to carry Iredell County was Jimmy Carter in 1976, who was a native son of Georgia and the South. Farming is still a major source of income for many Iredell County residents. Dairy farming has been particularly popular in Iredell County since the early 1800s, in both the northern and southern sections of the county. However, the rapid population growth and development in southern Iredell County is putting increasing pressure on farmlands, and many farms in this section are giving way to shopping centers, housing developments, and large corporate office parks. Iredell County is a major hub of NASCAR racing, with many race shops located in the county (mostly around Mooresville). Universal Technical Institute operates NASCAR Technical Institute under licensing agreements. The school offers racing-related instruction to prepare the student for their job search in the racing industry. Many NASCAR drivers live around Mooresville and Lake Norman. Although northern Iredell County has retained much of its rural character, the southern half of the county is experiencing rapid suburbanization and population growth, largely due to the immense popularity of the Lake Norman area for residents of nearby Charlotte, North Carolina's largest city. Lowe's has its corporate headquarters in Mooresville. Mitchell College, Statesville: Mitchell Community College was originally founded in 1856 in Statesville, North Carolina, as Concord Female College. The school was purchased by Robert and Roxanna Simonton around 1872 and renamed Simonton Female College. It became Mitchell College in 1917. Iredell County is served by two railroads, Alexander Railroad and Norfolk Southern Railway. ^ a b "State & County QuickFacts". United States Census Bureau. Archived from the original on July 11, 2011. Retrieved October 21, 2013. ^ Martin, Jonathan; "North Carolina History Project - Iredell County". Retrieved November 4, 2014. ^ "Boundary change boosts Charlotte metro population". Retrieved February 25, 2019. ^ "A Complete map of North Carolina from an actual survey". North Carolina Maps. UNC Digital Collections. Retrieved December 31, 2012. ^ a b Lewis, J.D. ; "Iredell County Towns with Post Offices". Retrieved January 31, 2019. ^ Lewis, J.D. (2012). NC Patriots 1775–1783: Their Own Words, Volume 1, 2, 3. ^ "North Carolina Land and Property". Retrieved February 11, 2019. ^ a b "List of taxable property in the county of Rowan, North Carolina, anno 1778 (transcribed from several lists returned by the August term anno 1778, also see page 30 for tax lists of 1784)". Retrieved Feb 6, 2019. ^ Miller, Mildred. Peggy Byers Gray and Robert Ernest Mize (ed.). From Stirling to Sterling, the Bicentennial History of New Sterling Associate Reformed Presbyterian Church. 1987. The Delmar Company. ^ Spencer, Preston; Statesville Record and Landmark; "Faith & Freedom: The history of Iredell's black churches". Retrieved February 1, 2014. ^ "Campbell takes oath as new Iredell sheriff". statesville.com. Retrieved 5 March 2015. ^ "School". ncpublicschools.org. Retrieved 2015-12-28. ^ "Collaborative College for Technology & Leadership". Retrieved 12 October 2012. ^ a b "North Carolina High School Districts | Best High Schools". U.S. News & World Report. Retrieved 2015-12-28. ^ "Langtree Charter Academy". Retrieved February 17, 2019. ^ "Iredell Charter Academy". Retrieved February 17, 2019. ^ "Woodlawn School". Retrieved February 17, 2019. ^ "Clio's Nursery, NC Historical Marker M-23". Retrieved February 17, 2019. ^ "Troxler, George W., 2006". NCPedia. Retrieved February 17, 2019. ^ Hill, Michael (2006). "Crowfield Academy". NCPedia. Retrieved February 1, 2019. ^ "Vance House". Retrieved Feb 14, 2019. Keever, Homer M.; Iredell Piedmont County, with illustrations by Louise Gilbert and maps by Mild red Jenkins Miller, published for the Iredell County Bicentennial Commission by Brady Printing Company from type set by the Statesville Record and Landmark, copyright, November 1976, by Homer M. Keever.